Get ready for another season of sloshed storytelling. This week, Comedy Central renewed Drunk History for a fifth season. The comedy series features historical reenactments based on a guest’s drunken narration. Previous guests have included Lin-Manuel Miranda, Lauren Lapkus, Jenny Slate, Bob Odenkirk, Paget Brewster, and Natasha Leggero. 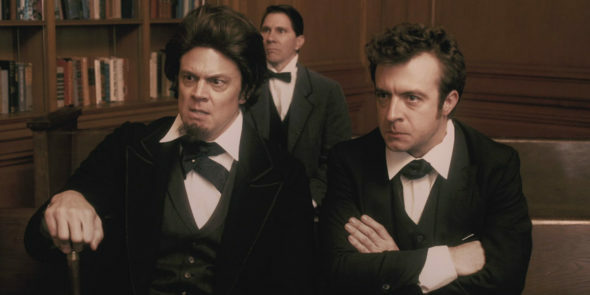 Comedy Central has ordered 14 episodes for season five of Drunk History, which are slated to premiere later this year. PASADENA, CA, January 13, 2017 – Comedy Central has renewed the Emmy(R) Award-winning series “Drunk History” for a fifth season, it was announced today by Kent Alterman, President, Comedy Central. The 14-episode fifth season is scheduled to premiere in 2017. “More ‘Drunk History?’ Say no more,” Alterman stated. Created for television by Derek Waters and Jeremy Konner, who also split directing duties, “Drunk History” is the liquored-up narration of our nation’s history. Hosted by Waters and featuring an ever-changing cast of actors and comedians, the series presents all the rich tales that the past has to offer. Booze helps bring out the truth. It’s just that sometimes the truth is a little incoherent. “Drunk History” is produced by Gary Sanchez Productions and executive produced by Waters and Konner, along with Gary Sanchez Productions’ Will Ferrell, Adam McKay and Owen Burke. Ian Friedman and Daniel Wolfberg are the Executives in Charge of Production for Comedy Central. What do you think? Are you a fan of Drunk History? Are you glad it’s been renewed?